Here’s your dose of red, white, and blue for this Fourth of July, which is Independence Day in the United States. When I visited Tejas Camp in Williamson County on May 14th I found exactly one Ipomopsis rubra flowering. Other plants of the species were there, but only this one had matured enough to blossom. 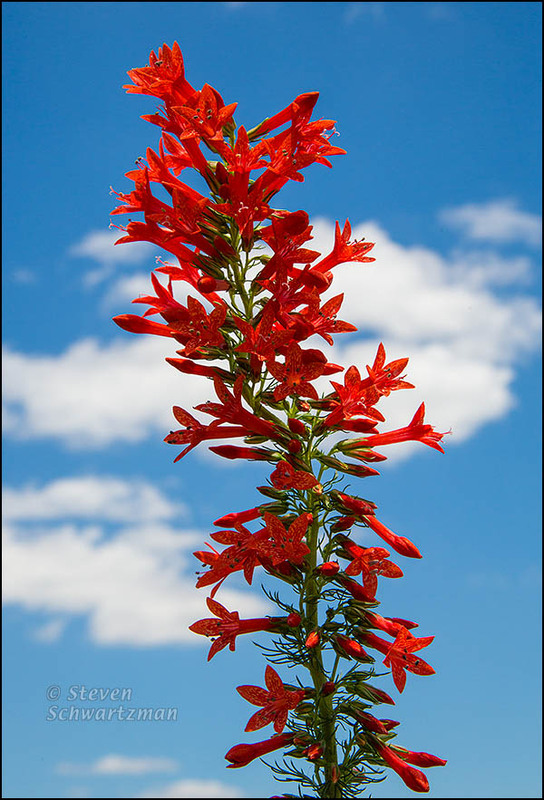 Common names for the species are standing cypress and Texas plume, both of which make reference to the plant’s feathery (i.e. finely dissected) leaves, a few of which you can glimpse in the lower portion of the photograph. Beautiful shot and so appropriate for today. It’s amazing how my mind can see the flag with the simple juxtaposition of these three colors. Context is a powerful thing, isn’t it? And a good imagination adds to the mix. Happy juxtaposition to you. Nice….it makes me feel quite small. Enjoy your 4th, Steve. You too, my namesake and fellow nature photographer. Thanks, Z. We’ve crossed into July now, so I’ll have a happy 1st weekend on this 4th weekend. I originally planned to post this picture not long after I took it, but I realized it would be especially good for this occasion, so I held on to it. You can say I’m Independence-minded. Beautiful way to start a special day! Merci, and your comment even rhymes. What a beautiful combination of red, white and blue. It was worth saving for today. It’s a photo that “pops” as much as any firecracker. I like the way your “pops” combines the worlds of sound and sight. You’re welcome, Margie. I’m glad you’re enjoying the parade of nature. Can I interpret that as “more”? These stalks, which grow erect and surprisingly rigid, produce flowers that are magnets for hummingbirds and nature photographers like me. That is really magnificent, and so appropriate for the 4th of July. This is one of our majestic wildflowers, all right, and one that stands up tall for the Fourth of July (and on other days too).